Ukraine's court finds ex-country's president Yanukovych guilty in treason case | Russian Legal Information Agency (RAPSI). MOSCOW, January 24 (RAPSI) – The Obolonsky District Court of Kiev on Thursday found ex-president of Ukraine Viktor Yanukovych guilty in treason case, according to court video records. 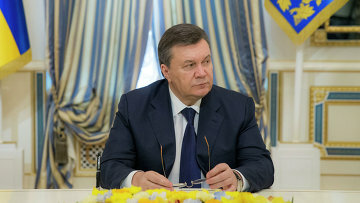 Although Yanukovych pleaded not guilty, the court questioned witnesses, examined evidence, listened arguments of defense and prosecution and then held that the defendant’s guilt on treason, accessory in crime and planning, preparation, initiation or waging of a war of aggression was fully proven, a judge said. The sentence is being issued for Yanukovych in absentia. On July 5, 2017, Yanukovych told Russian journalists that he refused to take part in the trial. According to Yanukovych, he does not want to participate in a trial with a predetermined outcome adding that “lawyers are powerless in a country of annihilated justice”. In December, Ukraine’s Prosecutor General Yury Lutsenko read charges against Yanukovych in a court through videoconference link. According to Lutsenko, Yanukovych, who was involved in violation of Ukraine’s territorial integrity, is held responsible for a 1.8-trillion-hryvnia (about $70 billion) damage caused to the country. Shortly after, the Pechersky District Court in Kiev issued an arrest warrant for Yanukovych in absentia. The Ukrainian prosecutors accuse the former president of using fire arms against protesters in Kiev in late 2013 and early 2014. 11:30 24/01/2019 The Obolonsky District Court of Kiev on Thursday found ex-president of Ukraine Viktor Yanukovych guilty in treason case.